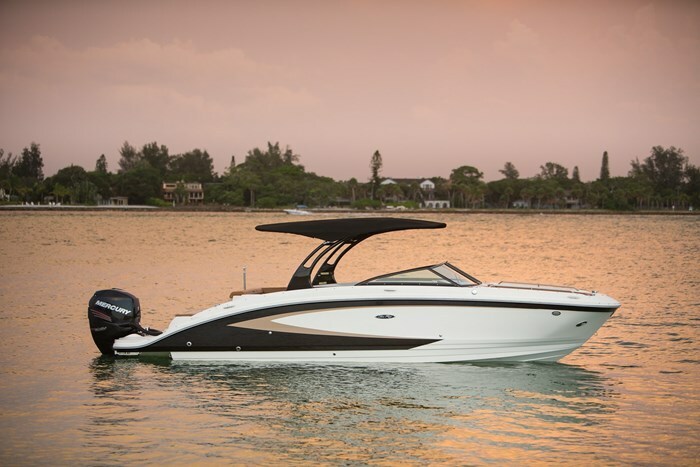 The 270 Sundeck® in both sterndrive and outboard configurations plus the 290 Sundeck® are new models for 2015 in Sea Ray’s ten model Sundeck® lineup ranging from twenty-two to thirty feet. 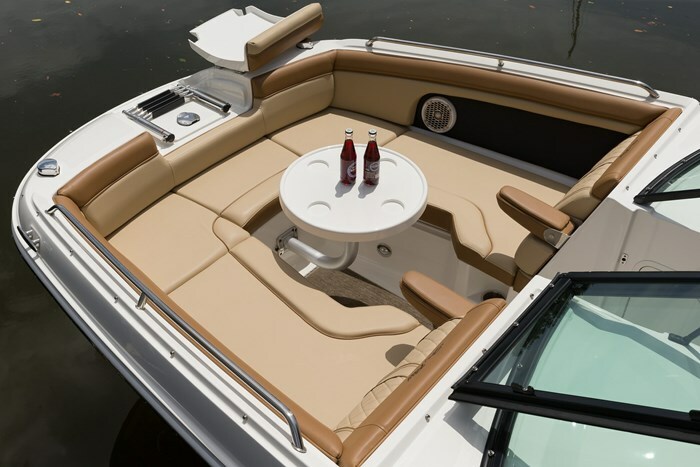 Both the 220 and 240 Sundeck® models, in addition to this 270, are available with outboard as well as sterndrive power. 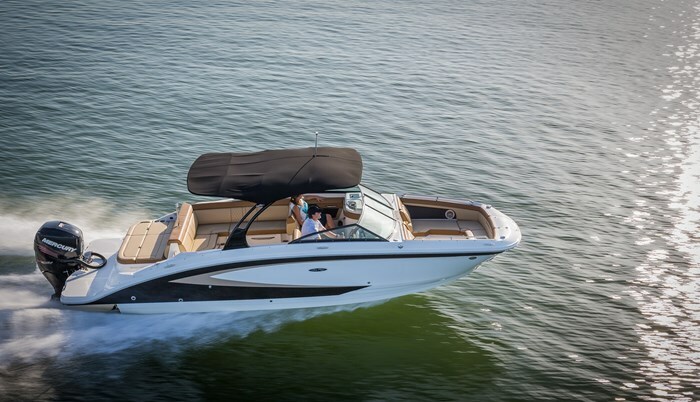 In total, Sea Ray offers an incredible selection of forty models of sport boats, sport cruisers, sport yachts, and L-Class yachts from nineteen feet to sixty-five feet. 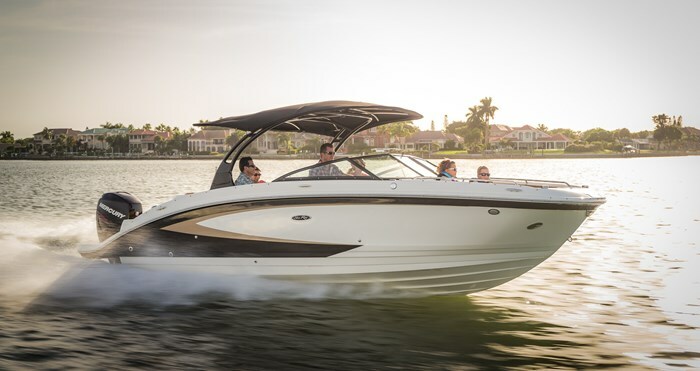 Deck boats of all sizes have become increasingly more popular due to their accommodation and versatility without sacrificing performance and this new 270 Sundeck® Outboard by Sea Ray exemplifies all of those attributes. It is big and it is deep and it is rated to carry fifteen persons on board should you ever need or even want to have that many at any one time. But if you do, it can handle them in comfort. The 270 Sundeck® Outboard rides on a very deep-V 21-degree deadrise hull on a full maximum trailerable beam of eight and a half feet to provide a smooth ride and to handle whatever water conditions you may encounter. 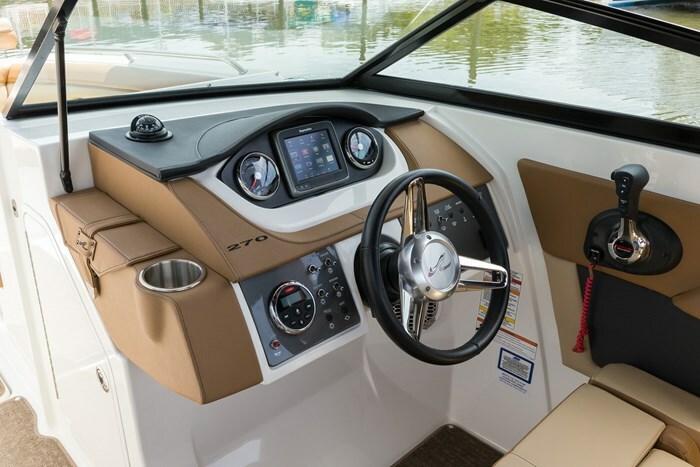 And the interior layout and amenities on this outboard version are absolutely identical to the sterndrive version right down to and including the transom sunpad and the full-width swim platform. So you are not sacrificing anything by choosing outboard power and in fact may be gaining. But more on this later. Both the driver’s helm and companion cozy double-wide or large single seats have swing-forward backrests to accommodate both forward seating and rear-facing lounging. Both of these seats feature forward flip-up bolsters and the driver’s side has an adjustable slider. Aft of both of these seats are extended benches and the portside bench extends aft and L-shaped right across the transom to the starboard side walk-thru to the swim platform. A standard removable cockpit table with dedicated storage serves this starboard lounge. An aft-facing transom sunpad/lounger incorporates an articulating feature to provide comfortable thigh and calf support when seated. The full-width swim platform has an under-mounted three-step stainless steel telescoping boarding ladder. Convenient storage is found in the floor of the transom walk-thru and of course an additional huge transom storage area replaces part of the cavernous area where the inboard engine would be in the sterndrive powered model. 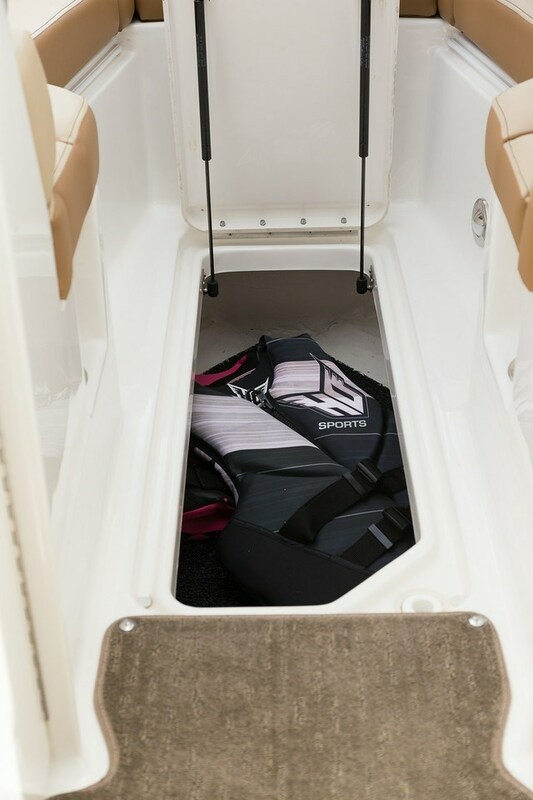 A large in-floor storage compartment with rubber matting located between the two helm seats can hold any amount of watertoy accessories. 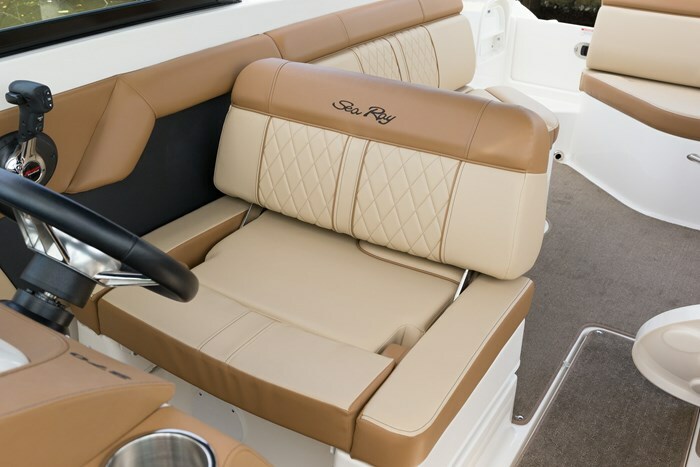 The bow seating area on the 270 Sundeck® Outboard is full U-shaped with lots of kneeroom and full backrest padding all around plus flip-down armrests when the side seats are used as loungers. A standard forward four-step stainless steel boarding ladder is useful for those occasions when beaching the boat is possible. A second in-floor storage locker is located between the bow seating and more finished storage is under the side cushions. Also forward is a dedicated anchor locker. The driver’s helm features a custom upholstered Soft-Touch vinyl-covered dash behind a padded rim stainless steel tilting steering wheel. 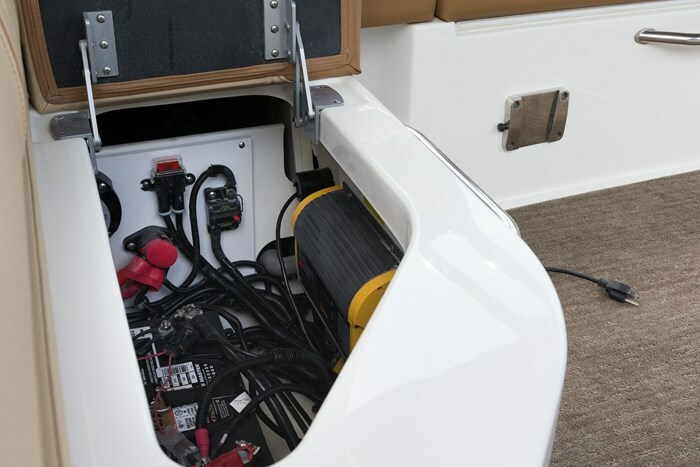 Standard instrumentation includes custom Sea Ray SmartCraft® gauges with chrome bezels and low glare blue night lighting plus SmartCraft® diagnostics including all of the normal monitoring functions plus fuel consumption/usage, hour meter, etc. 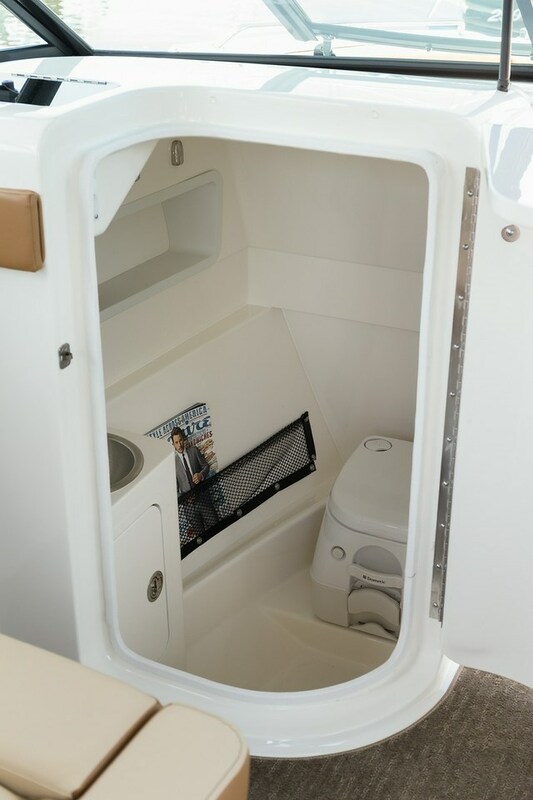 The passenger console contains a privacy head compartment complete with molded fibreglass liner, porta-potti, sink with pull-out sprayer, vanity, mirror, opening portlight, plus storage. Other notable standard equipment includes an aluminum arch with integral bimini top with storage boot, a drop-in magnetic ski-tow bar, acrylic bow block-off doors, AM/FM stereo with wireless Bluetooth™, MP3 port, iPod® connector, and digital cockpit remote control, a carry-on cooler, two 12-volt accessory outlets, a starboard side fold-down entry-assist step, additional bow and transom pull-out sprayers, plus a personal item helm storage “saddlebag.” Standard power is a 250 horsepower Mercury® 250XL Verado® FourStroke outboard with stainless steel propeller. Notable optional equipment includes several canvas options, an upgraded cockpit vinyl and carpet colour option, cockpit wetbar with sink and faucet, cockpit Coolbox, blue LED indirect cockpit lighting, bow filler cushions, bow table, underwater lights, docking lights, VacuFlush® head, SeaDek® swim platform matting, Premium stereo upgrade, Raymarine® chartplotter/digital dash, Smart Tow® digital speed control, trim tabs, anchor windlass, windshield wiper, battery charger, an upgraded watersports tower plus accessories, a dual axle roller trailer, and several choices of two-tone and full hull colours plus graphics. You can also upgrade the power to a 300 horsepower Mercury® 300XL Verado® FourStroke outboard. So why might you want to consider choosing outboard power when sterndrive power in a sport boat this size has dominated for decades? Today’s outboards are so quiet, so efficient, smoke-free, and require potentially less maintenance and easier winterizing. 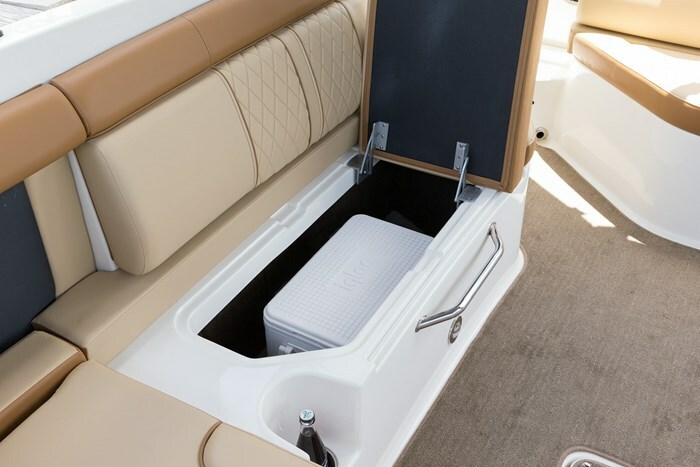 In the Sea Ray 270 Sundeck® Outboard, you gain almost a five hundred pound weight advantage, increased storage, no change in features, and the only potential downside being the loss of use of the centre portion of the swim platform. Outboard power is making more and more sense and catching on faster and faster.